Today is a welcome respite from all the Christmas stress festivities. Presents are wrapped, the gammon is simmering (which admittedly is Christmas-related, but hardly difficult) and the TV is most-decidedly switched off. By some kind of miracle, this morning was gloriously sunshiney and so I headed to the allotment for an urgent task: chrysanthemum care. Some background is needed here. Matt’s Granny and Grampy, now in their mid-90s, used to run a literal cottage industry growing and selling chrysanthemums. Their garden was heaving with them and come harvest-time the living room (so I am told) was filled with black florestry buckets overflowing with blooms. Apparently, when Matt was a boy, his job was to help put paper bags over growing buds to protect the saucer-sized flowers from the elements. 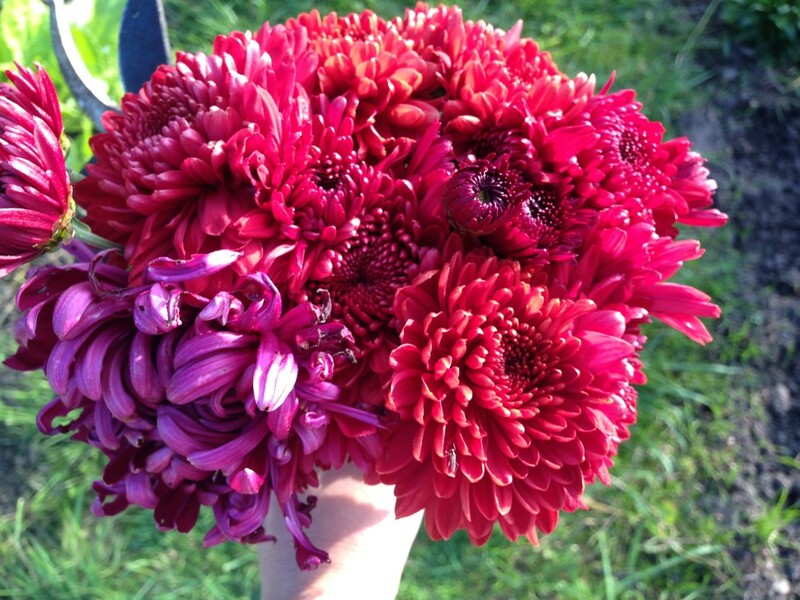 Knowledge of chrysanthemums is the Hunter/Foster-family legacy. It’s shaped Matt’s upbringing in much the same way that knowledge of coal and how-to-light-a-fire has shaped mine (my Dad and his father before him were in the coal trade). So when Grampy heard that I had an interest in growing my own, he very generously offered a load of plants out of his garden. 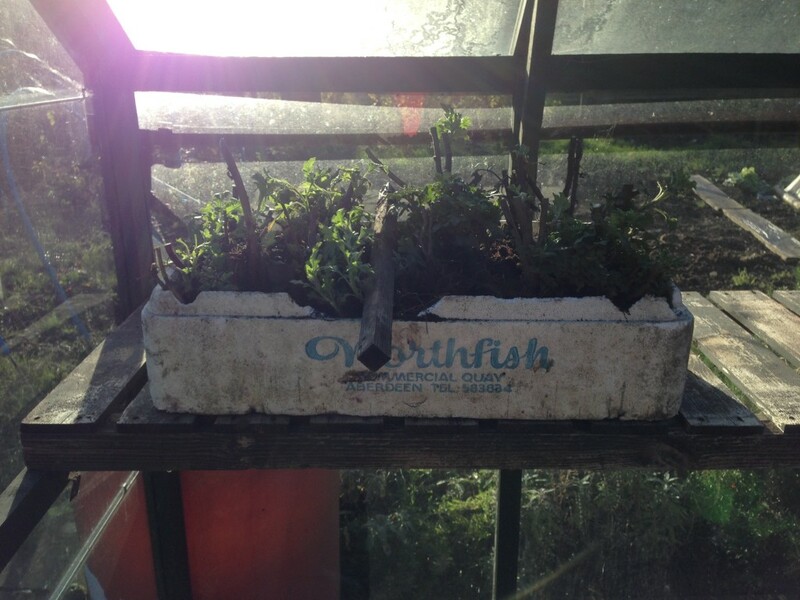 We arrived home yesterday with a tray full of soil, root and twigs, and strict-instructions for what to do with them. From October this year. In 2016 I’d like a whole lot more of this! My chrysanths this year were brilliantly colourful, but I think slightly lacking in blooms. Next year I’d like to grow more and also see if I can extend their season, maybe bringing some indoors to protect them from the Birmingham winds. Grampy told me that I have to dig up the faded plants, trim the stem down to a few inches, and put them in a shallow tray filled with compost. They will stay thus confined, in the greenhouse, until they start to shoot in the spring at which point we will take cuttings. Any signs of frost and they need covering with fleece. I feel genuine pressure at being primary care-giver for these important plants – it’s a bit like being asked to cook for a really really good chef. Let’s hope we don’t let Grampy down. Also on the allotment: Harvesting mustard spinach, mizuna, chicory, spinach, chard, leeks, parsnips. 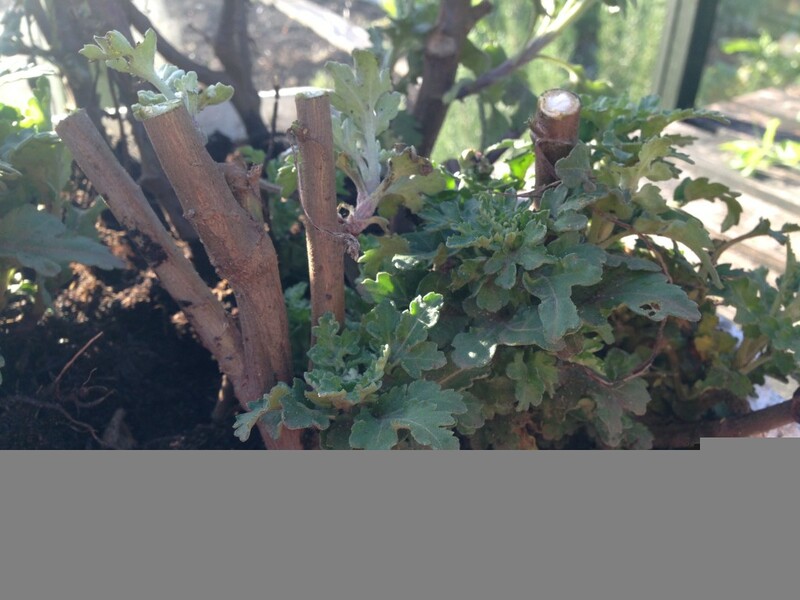 This entry was posted in Allotment, Winter and tagged chrysanthemum, cuttings, over-wintering. Bookmark the permalink.